This Amish Poly Patio Furniture Dining Set includes a patio table and four outdoor dining chairs. Customize your new patio dining furniture in the color to suit your style. This patio dining set will look beautiful on your patio, deck or in the garden. You can feel good about purchasing poly patio furniture since its a green, environmentally friendly product. More than ever, the lawn, patio and pool are where you rest and relax. Our dining sets have been designed and built to help make that possible. 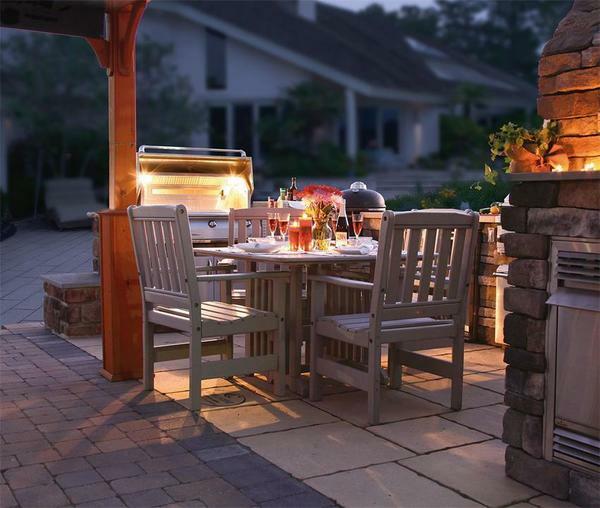 Enjoy a nice dinner on your new, durable, high quality weather proof outdoor poly furniture! Made of recycled plastic, the Amish Poly Patio Dining Set - 43" Square Table and 4 Arm Chairs is the eco-friendly, maintenance-free choice in outdoor furniture. Poly Lumber, a wood substitute made from recycled materials, will not chip, crack, rot, or develop mold. It is mildew resistant and termite resistant. It requires no maintenance like painting or replacing pieces. Just clean the Poly Lumber with soap and water. All-purpose cleaners or bleach and water solutions take care of extreme cleaning needs. This Amish Poly Patio Dining Set is built by skilled Amish woodworkers in Ohio who make quality furniture, no matter what material they use. It is available in a variety of color choices to fit any décor. Enjoy years of carefree comfort with the Amish Patio Poly Dining Set. This outdoor furniture usually ships within 2-4 weeks of purchase.